Family, Faith, and Fridays: Can You Connect the Dots? I love fun reviews! OK, I love most reviews, but the ones that require no hard work- well, those are just a bonus. 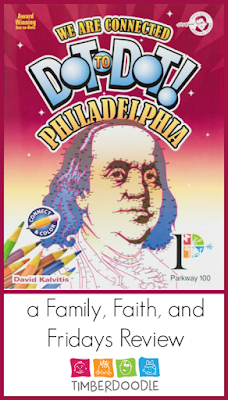 We Are Connected Dot to Dot Philadelphia is one such review. I asked to be a part of this review because I knew my 6th grader would love it, but let's just get it out there now and say it has been just as much fun for me as well. The timing was also perfect as, yes, we are still living out of suitcases with our move and needed a little something fun to add to our day! The Timberdoodle Company graciously allowed us to try out this fun book. The Benjamin Franklin Parkway was opened in 1918 and is considered Philadelphia's "grand cultural boulevard." Its beginnings were actually started in 1892 and has had several architects and landscapers working on it since. The boulevard now houses parks, gardens, and special architecture as well as a huge collection of public art for all to enjoy. 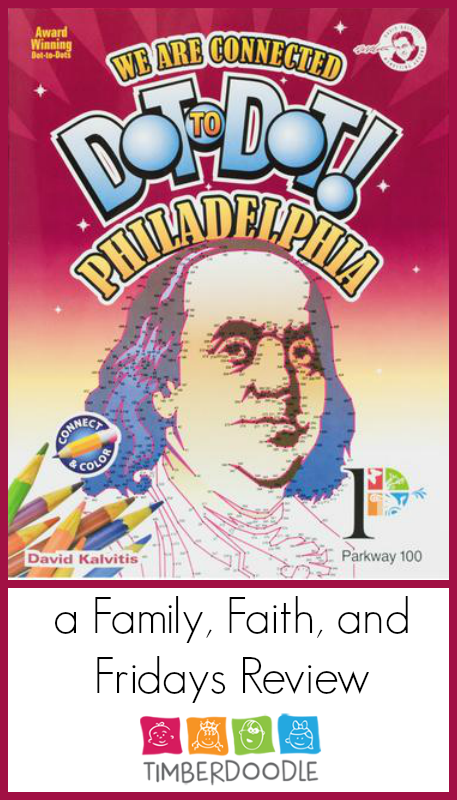 The 23 dot to dot puzzles in this book give you a quick tour of the area on or around the Parkway. The dot to dots were created to help celebrate the parkway's centennial. At the back of the book there is a quick description of each attraction, explaining why it is special to the area, thus providing a mini history lesson. Most of the puzzles in the Connected Dot to Dot Philadelphia are one page, but a few do spread out over two pages. This is not your typical dot to dot book! Each puzzle is quite detailed and requires multiple start and stops. For example, you may connect numbers 1-36 and then come to a "Star" instead of a dot, that indicates you stop your line, pick up your pencil, go to the next number, and begin a new line. When we first got the book, Colby and I did several puzzles together, taking turns every few numbers. We have even gotten brave and colored the first puzzle. Colby has since done a few by himself with no need for help from me. I, on the other hand, did need help from him when I tried to do one by myself. Figures, right?! Again, the numbers are quite tiny and I did have a harder time finding the numbers a few times. Guess it is glasses time! We did decide to complete the puzzles in pencil at first but I have gone back with mine and traced over with a fine black pen. I figured it is better to erase lines than mess it up at first! Upon recommendation in the instructions, we did also use a ruler to connect some of the numbers that were further apart with a straight line. For the architectural pieces it does give them a cleaner look. Don't need anything extra for school? Then just grab a pencil and your favorite chair, relax and have fun connecting the dots! What is This Civilain Life They Talk About?